This post is part of Epilepsy Blog Relay™ which will run from March 1 through March 31. Follow along and add comments to posts that inspire you! It wasn't until approximately a month after Sonya was officially diagnosed with epilepsy that I started to blog about the experience. 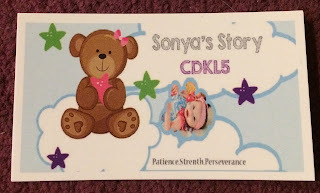 I created Sonya's Story while sitting at my oldest daughter's dance class while texting my best friend, about two hours after she was diagnosed with CDKL5. At the beginning of this journey the only way I was able to get my thoughts straight was to put them in writing, and honestly, some days, it is still the only way. However, two years into this journey and many lessons later, I have learned there are at least three creative ways to help you live with a child or family member who is diagnosed with epilepsy. Make jokes. I have found that laughter and making a (morbid) joke here and there (or all the time) are necessary to make it through the day or sometimes the hours. There is a lot of heartache that comes along with having a child who suffers from genetically caused epilepsy and serious discussions and situations can be made (significantly) lighter with a quick joke. I will admit that not everyone appreciates my humor in regards to Sonya, but I have made it through some very dark times because of it. Find an outlet. Whether it is playing a sport, writing, photography, arts and crafts, or juggling, find something that helps you get through the days. Having to care for a child or family member with epilepsy is extremely taxing on a person. It takes a lot to help manage the care of a person 24/7, ensuring medications are prepared and taken at scheduled times, making sure the environment is safe because there are not always warnings that a seizure is coming, these are only snipets of the responsibilities of a caregiver to a person who has epilepsy. It is vital for the purpose of sanity to ensure that a proper outlet is in place to help make this experience a little easier for you. Personal story cards. 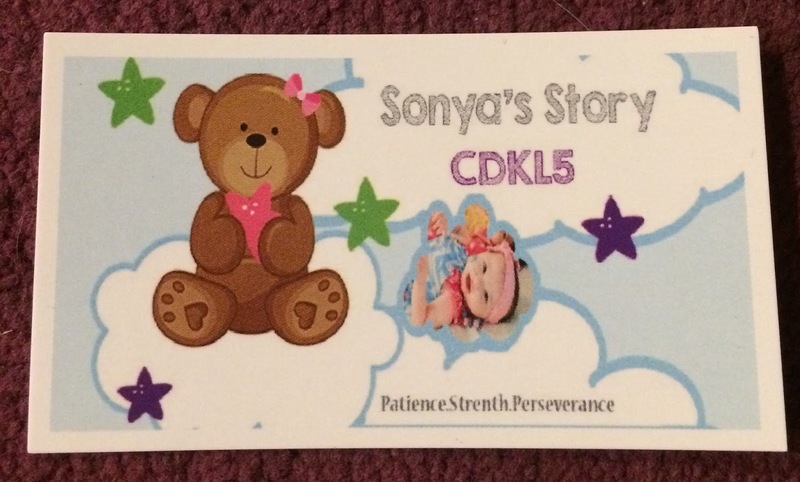 When Sonya was two and a half months old I used a template from the CDKL5 website to create her very first business cards. 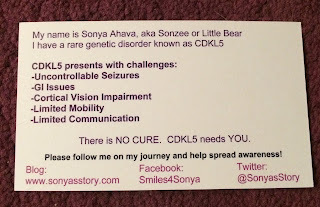 I handed them out to help raise awareness and to give insight on what exactly CDKL5 is. 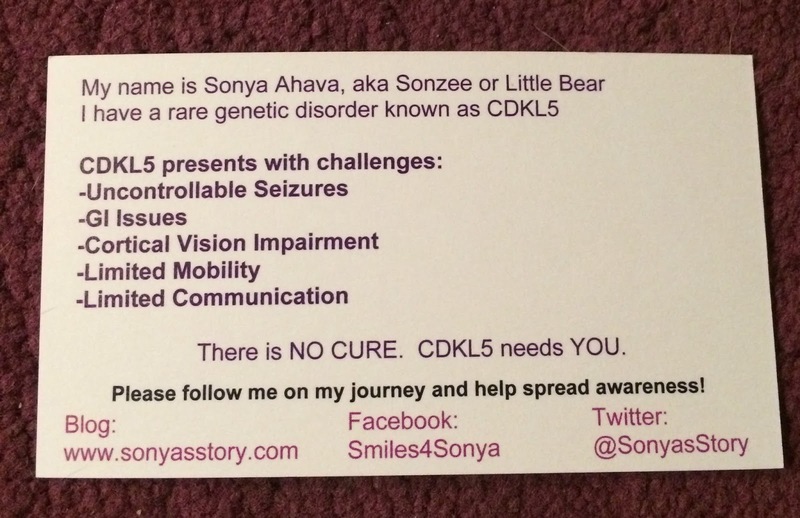 After the creation of Sonya's Story as a non-profit, I revamped the cards and still continue to hand them out weekly. I find these cards invaluable and use them in a variety of situations. 3. When someone asks about Sonya. 4. I admit I have not done the following, but it is on my bucket list. Take one of these cards and place it with a lovely note on the windshielf of a car inproperly AND illegally parked in a handicapped spot or on the yellow lines. Take advantage of respite. If your child's epilepsy diagnosis is secondary, and he/she qualifies for respite services, I cannot emphasize enough how important it is to take advantage. If you can have a friend or family member trained in providing these services, this will eliminate an additional stress. It is so important to take time to spend with your spouse, other children, and on your own. It is how you can help yourself to be as healthy as possible in order to give your child or family member the best care possible. There are so many other creative ways to help you live with a child or family member who has epilepsy. I hope you will find some of these (if not all) to be useful to your situation. Next up: Be sure to check out the next post tomorrow at livingwellwithepilepsy.com. For the full schedule of bloggers visit livingwellwithepilepsy.com. And don't miss your chance to connect with bloggers on the #LivingWellChat on March 31 at 7PM ET. Crying is not really my thing. In fact, prior to Sonzee I am pretty certain there were maybe a handful of people who I allowed myself to cry in front of. I like to be the strong person, the one who sort of (pretends to) hold(s) it together for others, the one who likes to stay in control. Then came Sonze. The girl who has changed so much about my world and the person formally known as "Randi". I am not sure if or which version of myself I prefer over the other, but I really miss the me who did not cry as much. There was a time after I became used to watching her seize that they stopped evoking any type of emotional response. Yes, it is heart wrenching, yes, it is unbearable to watch, yes, it is absolutely tragic, but it is also part of our every day, and it is our typical. I remember the days when she was a newborn and I would drive with my eyes staring at the rear view mirror waiting for her to seize so I could pull over. I now honestly cannot remember the last time I watched for her to seize while driving. There was a time when she was tiny and little that I would hold her in my lap while she was actively seizing and I would say to her "you are okay", and then one day it dawned on me that nothing about seizing is okay, so I stopped. I used to get tears in my eyes at the sheer thought of a seizure coming on and then after some time it all just became matter of fact. For the past couple of months, I became an expert at being able to watch her seize and carry on conversations, or just peak at her in her crib in the middle of the night and then go back into my bed knowing that her alarms will tell me if there is actually something I can do for her. Maybe it was because I expected them to stop, maybe it was because I was in denial about their forceful return, but this week the tears are back. I have said more times than I can count that we were warned about the dreaded "CDKL5 toddler years". I thought I was mentally prepared, or maybe it I was just in some form of denial that it would not be so bad for Sonzee (I really should know better by now, she is Sonzee). After all, we made it without an admission for anything other than tube replacement for 10.5 months, but then again, she just turned two. I think a little grace period after she hit official toddler zone would have been nice. She is only 6 weeks into her toddler years and already her seizures and GI system are becoming worse. There does not seem to be a permanent fix for either of these, so I have a feeling I am just going to have to get used to crying. It is 10:45pm on March 20, 2017 and we are in room 8128. We do not normally face north so this is a nice change of view for me, instead of watching the planes fly into Sky Harbor, I get to watch the cars drive on SR 51. Since March 2015 during this exact week I have found myself surrounded by the same walls, in various identical rooms, and usually cared on by a friendly face. With a stroke of luck, it just so happens that tonight we are with one of Sonzee's very first PEMU nurses. One of the benefits of the experience is when the nurse coming to take you to your room opens the door and says "welcome back" and you see the same smiley face that has been there to wipe your tears in the past. There are so many adjectives that I have in my mind to describe being in this predicament; comical takes the lead, followed by unfortunate, nervous, weary, relieved, eager, and my list definitely goes on. I foolishly started to think that we would slide right past this anniversary without celebrating in Sonzee style. I suppose that is what I get for getting too overconfident, for thinking that things could actually take a positive spin for little bear. This is the part that hurts me the very most. I just cannot understand why my baby girl just cannot catch a break. 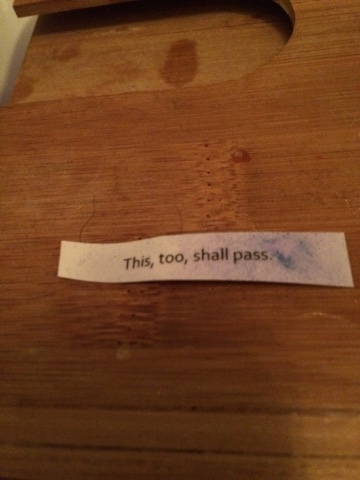 Every time I start to see a small glimmer of hope it just gets ripped away. I really am having a huge challenge comprehending this reoccurring Groundhog Day type of testing. Clearly something is not being done correctly or it would have stopped repeating already. This is one of those parts of living the medically complex special needs type of life that makes you muster all that is inside you and push through because there is no other choice. There is no other way to make it through these times without reminding yourself that there is clearly a reason for all this pain and anguish and it will one day be revealed...unfortunately it was not in 2015, 2016, or 2017...and in 2018 I will just buy Sonzee a cake and schedule an in-home party for the week of March 18. It has taken about two weeks and endless hours of multiple people's lives (that no one will get back), but we are finally going to be able to give Sonzee her first dose of her new seizure medication, Zonisamide tonight. While we try not to do too many changes at once, it is always inevitable that certain things will overlap and in this case it is all medication based, so hopefully things won't go completely wonky. In a sense the comical insurance ordeal played out in our favor as it gave us time to do a slower wean of her Sabril and as of yesterday she was given her last dose of gabapentin. I am unsure when the build up of these drugs will fully be out of her system, or for Sabril to be at the current dosing level, but these times are always a bit nerve wracking for us. The gabapentin we are 100% sure did nothing for her in any area so I am just looking forward to seeing what, if any, side effects she might have been having that we didn't really notice but are now will no longer be bothering her (i.e. Dizziness, blurred vision, headaches, etc.). As far as Sabril goes, it is not an effective treatment for her current seizure type (I call it the seizure variety platter as it displays itself in various forms over a 5-7 minute time period), but we are unsure if it is still keeping the nasty spasms at bay and responsible for her EEG background being clean. To say we are petrified about being off that medication is quite an understatement, but we also do not want her on more than two seizure medications at a time and keppra is effective at keeping another form of her seizures away, so it is what it is. It is always trial and error, and sadly it is Sonzee who has to be the house Guinea pig. At this point I am eager to see how she reacts to the zonisamide and am hopeful it will treat her current seizure activity. I just pray (as usual) that the changes we are making just make tiny ripples in the water, that we don't rock the boat too much, and most importantly that is does not capsize. It does not cease to amaze me that one minute I can be mourning parts of the life we now lead and then a mere 60 seconds later I can be so excited about something I never imagined myself being elated over, such as purchasing new medical equipment. Maybe it is because in my mind I had always pictured Sonzee in most of the equipment we have already gotten for her, or maybe it is because I always anticipated it would be in her cards. Whatever the reason I will embrace it and admit aloud how I am extremely excited (and quite ready) to be on the mission of ordering her wheelchair. I have spent hours online looking at what I felt would be the best fit for her. I of course want her to have all the bells and whistles and for me I cannot emphasize how excited I am at the prospect of having specific areas to place her rescue medications, feeding supplies, and portable oxygen concentrator. Those items can be extremely heavy and the stroller does not provide adequate storage opportunities. I am looking forward to her having an adequate tray for toys while we are on the go and proper support for her body because it has to be frustrating for her when she is tired and her head flops to the side. I believe we have settled on the R82 Stingray tilt in space and I am so excited! It looks like a stroller (this might be annoying as she gets older), pushes like a stroller, and as far as features go it has a million. My favorite is the 180 degree seat turning option so she can face me or face outwards. It can be taken apart and folded to be stored and will fit in the back of the mini van folded. I never anticipated this moment to be filled with actual joy and eagerness, maybe that will change when it arrives, but I am pretty sure based on my feelings right now that I am just ready and have accepted this portion of the journey. Now to see what color she chooses! The majority of days it doesn't phase me that our life is atypical. I am so used to it now that it has just become routine, almost an afterthought, especially when I am without Sonze. There are always times throughout the day, even on one of my "majority days" where I momentarily yearn for the normalcy of what life could have been, but I don't ponder it for too long because it doesn't change anything. But then there are some days that something happens and I feel like I've been stabbed in the chest. Those moments come out of the blue, randomly, and catch me completely off guard. They are usually triggered by something typical that I had forgotten used to be or should be in my life. Today it happened as I was watching Sonzee's older sister at gymnastics. We don't normally attend Tuesday, but due to us going to Colorado we scheduled a make-up class. Sam stayed at home with Sonzee so she could have her rescheduled PT session, so it was just me and my coffee enjoying the view. I was sitting down watching all of the classes when the slap occurred. Coach Susan was teaching the "mommy and me" class. The class that Sonzee should be in, the class that she would have been in because it occurs at the same time her older sister's class occurs. I had forgotten I changed from Tuesday to Thursday for her older sister specifically because Coach Susan has that "mommy and me" class and her aged class has a different coach, or was it more as a protective measure to prevent the situation I found myself in today? I watched the class for only a a couple of seconds before everything clicked and the tears came into my eyes. I was talking to another mom who doesn't know about Sonzee so I quickly rid myself of the tears. But the pain still remained. The emptiness in the pit of my stomach still remained. I dislike these little "punches", once they happen the sting remains for the remainder of the day making me somber and annoyed. It's hard to bounce back to being "okay" with how things are after such a stark reminder of how much things aren't typical for us. I know these moments will still continue to occur, I feel like I've written about them before as well. I am thankful and glad that the majority of my days are spent wrapped inside a world that has become my familiar territory. It's a place that I feel safe and comfortable and where we belong. But on some days I get pulled into a life that isn't mine, but one I'm not quite ready to give up. It's Monday afternoon and I'm sitting in one of those comfort places of mine. A place that I see friendly familiar faces, occasionally a friend or two, and the faces of parents who don't have to talk but I can read their thoughts as they hold their phones with the hand sporting the bright orange bracelet. I'm sitting in a comfortable red chair, facing the wall with the dancing flowers and Phoenix Childrens Hospital hands that our three year old loves to jump on as they flash across the floor, and next to the Starbucks where the barista asks where I have been if she has not seen us in a week. We have nowhere to rush to and Sonzee is asleep (contemplating having a seizure; I can feel one on the horizon) and so I'll sit here with my coffee and oatmeal and write. The seizures unfortunately haven't gotten any better. I was not expecting them to, so it isn't a disappointment. I'm not even upset that for the past week we have been in "new medication choice limbo". Sonzee's epileptologist gave us three choices (she is so sweet) and we ultimately get to make the decision. I often chuckle about the fact that our choice is which antiepileptic drug we try next. It is just so comical that this is actually a choice we are faced with every 6 months or so. So naturally for over a week we have played the "which side effects are the least atrocious" game, we actually came to a decision in what I consider record time, and we have chosen Zonisamide. She is still being weaned (because we take things extra slow with her) from Gabapentin, a failed drug for her that we were using for pain. Now we will start to wean Sabril. There is no reason to expose her to the potential retinal and vision damage if it isn't helping as much as it used to. Her seizures have changed and so Sabril is no longer effective. We are going to wean her extra slowly just in case we need to keep her on a low dose if it is keeping the spasms away and her background clear. I am unsure what to think about the changes. I have the butterfly feeling in my gut, but not the fear I have had in the past. I wonder if I am actually getting used to parts of this life. I don't know which way things will go, but it will either be a disaster or another (temporary) miracle. I know better than to create any type of expectation, so I'll just ride this one out. We leave tomorrow for Colorado. We will meet with a bunch of doctors, but I'm really only concerned with the GI doctor's opinion. I am looking for a lot of answers and I know if he doesn't have them, the odds of someone else having them are extremely slim. I don't want to get my hopes up, but I think that's too late. I know this visit will be greatly different than the one we had when Sonzee was 4 months old. They won't tell us they haven't seen her skills in other children with CDKL5 and they won't say that she is doing fantastic for a child with a CDKL5 mutation. Sam and I will most likely look at the other children there and wonder why her progress hasn't been the same. We will say it's because of everything she has been through, but it won't make it better because still I wonder why it had to be her. An answer I am guaranteed never to know. So for now I will just sit in this chair that has turned into a comfort spot, drink my coffee, and smile at the fact that while writing this post I ran into a friend and made a new one and consider the fact that sometimes it isn't about the answers, it is just about where the experiences on the path to potential answers takes you.